Baumann’s statement indicates that the event likely isn’t going to feature NBA superstars. I would expect FIBA to limit Olympic participants to players who have participated in the 3×3 World Tour or at least participated in FIBA-owned qualifying events. And that explains the whole reason for this thing: FIBA wants to make money. Basketball is massively popular around the globe, but FIBA doesn’t make any cash when you’re watching the NBA. Its soccer counterpart, FIFA, is drenched in billions because people care about the World Cup. But nobody cares about the Basketball World Cup; even interest in Olympic basketball is waning. As much as we love basketball, we don’t love anything owned by FIBA. Now no official announcement has been made yet in terms of the NBA’s participation, so we’re free to dream up hypotheticals for the time being. I was original going to blog about the potential teams we could be seeing in the upcoming Olympics but I got stumped trying to find a third German behind Dennis Schroeder and Paul Zipser (Dirk is going to be approximately 100 by the next Olympics). That idea seems kind of dumb anyways because any combination of Lebron, Durant, Harden, Westbrook, Curry, Leonard and Davis would easily win gold. So instead I’ve made different combos of US-born 3 on 3 teams that could win a gold medal if a hypothetical tournament were to break out today. Even with an average age of 34.4, this team would still curb stomp whatever 3 on 3 team any international team would trot out today. I was tempted to throw Chris Bosh on here because he isn’t technically retired but I think it’s safe to say that he’s done. 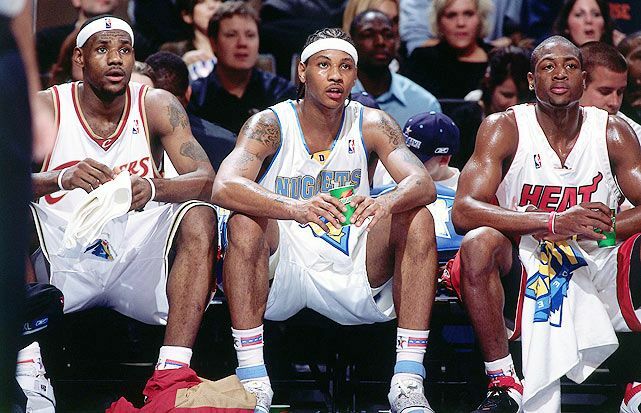 Even without Bosh this pickup team boasts the 7th (Lebron), 25th (Melo) and 34th all-time scorers. These golden oldies have and would continue to carve up the Olympics. In four years this team would be electric. If you were to play this tourney right now though I could see them getting bodied by a savvy veteran team like France or Australia. According to The Ringer’s Draft Guide, if everything breaks perfectly in their development and comparables this could be the equivalent of starting James Harden, Jason Kidd and Tracy McGrady, with Paul Pierce and John Wall coming in off the bench. While the international game has gotten better, Americans still own the NBA draft. You can take your Andrea Bargnani’s or your Anthony Bennett’s at first overall. But by volume and quality, basketball is still predominantly American and other countries still need to catch up. One of the most successful prep schools in the game, Oak Hill nation could win a Gold medal in basketball at the Olympics. Coach K steps back from the USMNT and hand-picks “his guys” for a little 3 on 3. Christian Laettner is on the sidelines as some sort of hittable mascot and spends the whole time yelling at refs and throwing stuff at opposing players. Sneakily–at least to me–the Longhorns have been pretty effective at churning out legitimate NBA talent over the years. This alumni list doesn’t even include (Canadians) Cory Joseph and Tristan Thompson. This team of John Calipari-coached players is stacked. It could be even better if Karl-Anthony Towns wasn’t committed to represent his mother’s country of Dominican Republic in international tournaments. Also known as the “Chip on my Shoulder” team. The state with the 4th most NBA players produced ever (behind Illinois, New York and California) this Philly team could be my favourite to watch. This would be some wicked, smash-mouthed streetball. This team would literally fight any team in the gym. As far as I’m concerned, the Olympics needs Dion Waiters and the Morris twins. You just don’t mess with Philly. This team doesn’t really do it for me. Three ball-dominant, heat check scorers, a pick and roll dynamo with no free throw ability and a gritty, physical power forward. Actually, never mind, I’d probably watch that. California is a hotbed for basketball talent. The Lopez twins were left off and I refrained from putting Derozan on this team over George (my boy Demar made an All-NBA Third team over PG this year sooo). Big Baller vs. the World. I don’t know if this would be a 30 for 30 doc, an Office-style mockumentary (Lavar doing crazy sh*t like Michael Scott and Lonzo just shrugging at the camera the whole time) or a Disney movie like D2: Mighty Ducks which pitted Emilio Esteves and the Ducks versus the world’s best hockey nations in Jamaica and Iceland. Type any of these guys into Youtube and you’ll be flooded with gravity defying jams and dunk contest highlights. At age 40 VC still throws down. Get Vinsanity back in the Olympics. I’m fired up to see AI and Ice Cube’s “Big Three” league rolling this summer. An early favourite for me has to be the “Ball Hogs” captained by Brian “White Mamba” Scalabrine and Josh Childress (with the best afro in the game). I’m also all in on Rashard Lewis’ “Three Headed Monsters” because of my boy White Chocolate. 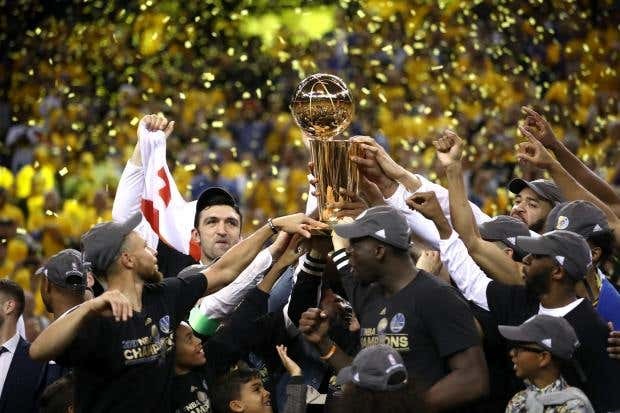 Why not get in on the Warriors hype machine. They could beat most of the teams I just made up and they’re a actually a real-life combo. They have a perfect balance of scoring, speed, handles, and swagger to be a pick-up game dynamo. Next bucket wins. All Hollywood 3 on 3 team for you Thomas. JIMMY CHITWOOD, JESUS SHUTTLEWORTH AND MOSES GUTHERIE. Chitwood will not be taking the last shot.